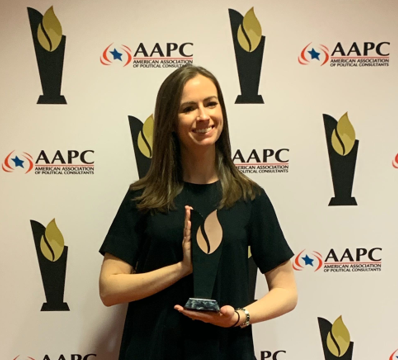 ARLINGTON, VA (April 5, 2019) – Deep Root Analytics, a leading media analytics company that partners with advertising and communications professionals to more effectively reach and track target audiences across paid and earned media platforms, is pleased to announce our recognition by the American Association of Political Consultants for Best Data Analytics Solution. We’ve built the most innovative and advanced TV targeting platform, and we’re honored to be recognized by our peers for our contributions in helping companies and causes more effectively reach the people they are trying to communicate with. We’re grateful to be included with so many great companies in this year’s class of Pollie winners. To learn about Deep Root Audiences, including how best to find key influentials on issues you care about, click here. To learn about how Deep Root can provide audience-centric, actionable insights to guide your paid media efforts, click here. To learn about how Deep Root can help you gain a larger return for a TV advertising budget of any size, click here. As audience and media consumption data experts, Deep Root brings the same proven media expertise trusted in politics to the public affairs landscape, having optimized more than $1 Billion in TV advertising since 2013. We’ve partnered with more corporations, trade associations and campaigns than any other media analytics provider. We connect every phase of your media cam­paign with an audience-centric strategy – identify­ing, activating, and tracking your target audiences across the paid and earned media landscape. For more information, follow @DeepRootX and visit deeprootanalytics.com.